Dave Brubeck: 1920 - 2012. 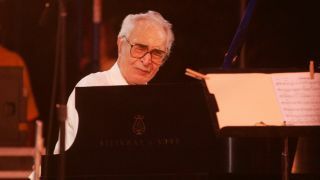 Dave Brubeck, the legendary jazz pianist and composer, has died at the age of 91. He will probably be best remembered for Take Five, the jazz instrumental in 5/4 time that became a mainstream hit. In fact, Brubeck experimented with non-standard time signatures throughout his career, which included tours with the likes of Duke Ellington and Ella Fitzgerald. He was also the leader of the Dave Brubeck Quartet, which was formed in 1951 and continued until 1967. The Quartet's drummer Joe Morello, who died last year, spoke to our sister magazine Rhythm in 2010. Brubeck died of heart failure in hospital in Connecticut in Wednesday morning. He is survived by his wife Iola, five of his children and his grandchildren.